The overnight express bus called “Yuhi” (literally, sunset), operating on the Ikebukuro/Shibuya and Tokyo/Shinjuku lines, is equipped with rows of three independent reclining seats with privacy curtains. With this spacious, comfortable equipment, you will be able to spend a relaxing time during your travels. Four-seat row buses are used for the services connecting Sendai-Honjo and to Yamagata. Seats in the long-distance overnight bus “Yuhi” are arranged in rows of three and all have ample reclining seats equipped with footrests and leg-rests. Large headrests and stepless adjustment allow you to relax in your favorite posture. All the vehicles called “Yuhi” are equipped with privacy curtains. Separating your neighbors with the curtains provides you with a comfortable private space. The buses used for additional operations during the high seasons (four-seat rows) are not equipped with privacy curtains. 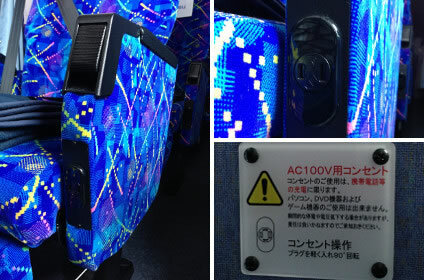 Some buses are equipped with AC 100V outlets, which are convenient for charging your cellular phone, etc. Outlets are placed at different positions depending on the type of bus. Please note that some buses are not equipped with outlets. The bus is equipped with a toilet to make your long-distance travel comfortable. Please note that in some cases of extra bus operations, tourist buses without a toilet may be used. The lever above the seat allows you individually to adjust the flow and the direction of air. Each seat is prepared with a lap robe for your temperature adjustment and slippers so that you will be able to take off your shoes and relax inside the bus. An adjustable reading light is available also on your armrest.